Your family will fall in love with homemade mac and cheese all over again. Trust us, this ooey-gooey oven bake is cheesier than you ever thought possible. Melt margarine in large saucepan on medium heat. Whisk in flour; cook 1 min., stirring constantly. Gradually stir in milk; cook and stir 3 to 5 min. or until thickened. Add Parmesan and 1-1/2 cups cheddar; cook and stir 1 min. or until cheddar is melted. Add macaroni; stir to evenly coat. 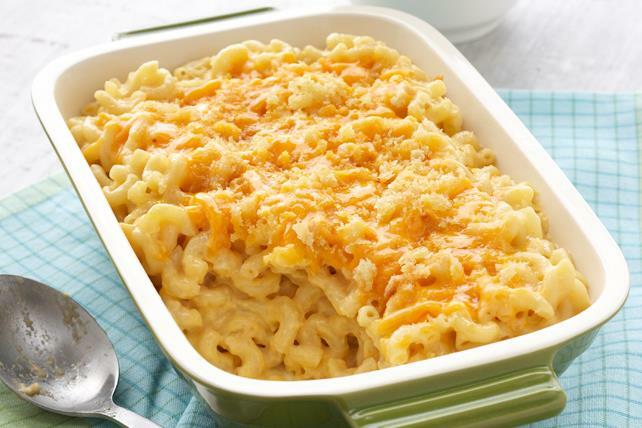 Spoon into 1.5-L casserole dish sprayed with cooking spray; top with remaining cheddar, then bread crumbs. Bake 20 min. or until macaroni mixture is heated through and topping is lightly browned. Add 1/2 tsp. dry mustard powder or 1 tsp. Heinz Dijon Mustard to cheese sauce before mixing with the cooked macaroni. Prepare as directed, doubling all ingredients, baking recipe in 3-L casserole dish, and adding 15 min. to the baking time.